Last summer I saw a great deal from one of those magazine websites. Three magazine subscriptions for $12. It was such a good deal, I couldn’t pass it up. So I paid the $12 and signed up to receive Better Homes and Gardens, Popular Photography and Everyday with Rachael Ray. And I found a promotion online where you could get Martha Stewart’s Living magazine sent to you for free. I was thinking this will be so great, I’ll have magazines to read and I won’t have to check them out at the library or read them at Barnes & Noble. So the magazines started coming, but somehow I forgot that each magazine comes EVERY month. That’s four magazines a month. I’m just happy if I can get through all of my e-mails in a day. The phenomenon of “reading for pleasure” doesn’t really exist in my world. Between my full time job and keeping up my blog, which seems to be my second full time job, it feels like the only free minutes I have are right before bed. As the magazines started pilling up, I felt guilty that I didn’t have the time to read them, so I would try to browse through them in bed before I fell asleep. Well, let me tell you.. there were many nights were I would fall asleep with my face stuck to Rachael Ray’s picture. And I wasn’t drooling over the mouthwatering pictures, needless to say. 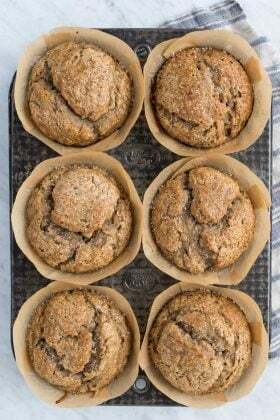 A few weekends ago, the weather was pretty gloomy so I didn’t have good natural light to shoot any recipes, so I hulled the stack of unopened magazines to the coffee table. I still had magazines from March that I hadn’t looked at. I finally got through them and I found a lot of great recipes along the way. 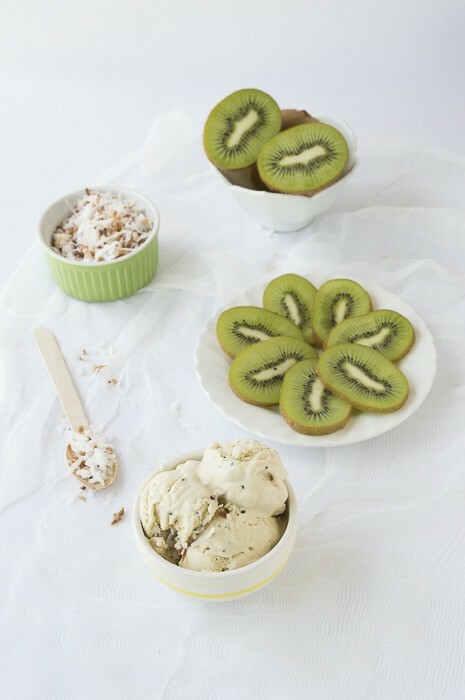 This recipe from Everyday with Rachael Ray for Kiwi Ice Cream was a stand out, especially because it only called for 3 ingredients – kiwis, marshmallow cream, and heavy cream. I feel like I am willing to try any recipe that incorporates marshmallow cream. 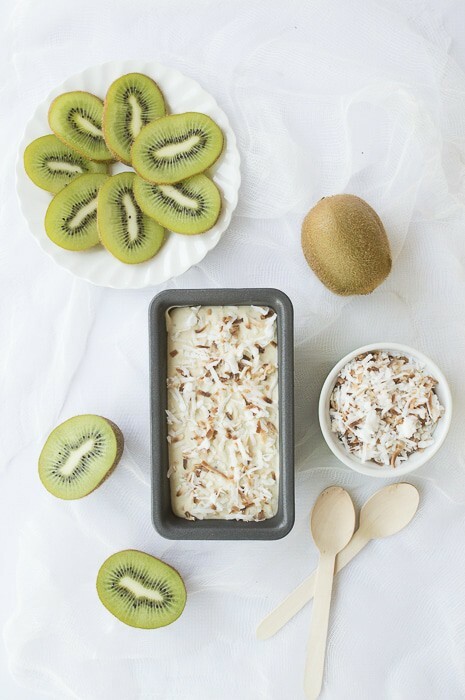 I ramped the flavor up a bit by adding oven toasted coconut because kiwis and coconut go well together, and I just simply love toasted coconut. 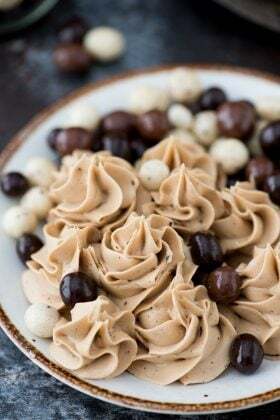 This is a fancy and unique twist to ice cream, and to me it feels a bit more grown up than eating cake batter ice cream on date night. Peel and slice the kiwis. This video shows how to easily peel a kiwi. In a food processor, puree the kiwis. Add the marshmallow cream and heavy cream and process until the mixture is smooth. Place this mixture in the bowl you want to freeze the ice cream in, I used a small loaf pan. Add the toasted coconut to the top, and lightly press it into the ice cream. Cover the bowl in plastic wrap. Recipe adapted from Everyday with Rachael Ray. Moral of the story? I should only subscribe to one magazine. It’s a good thing all of my subscriptions end this month. 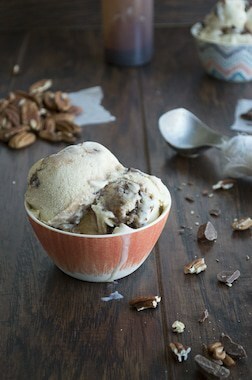 Similar Recipes: Banana Pecan Chocolate Chunk Hot Fudge Ice Cream (no ice cream machine needed!) 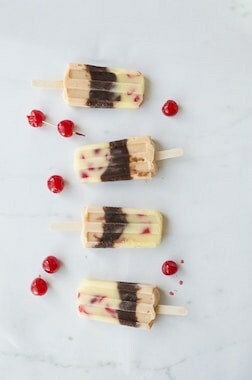 and Banana Split Pudding Pops. Gorgeous! Lovin’ these flavors. Pinned. 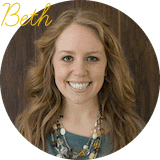 Beth this looks fantastic! 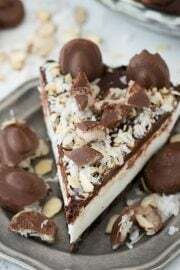 Love that you added the toasted coconut to it. And while I do enjoy a good cake batter ice cream, you are probably right in that I will feel more grown up eating this instead. Pinning! 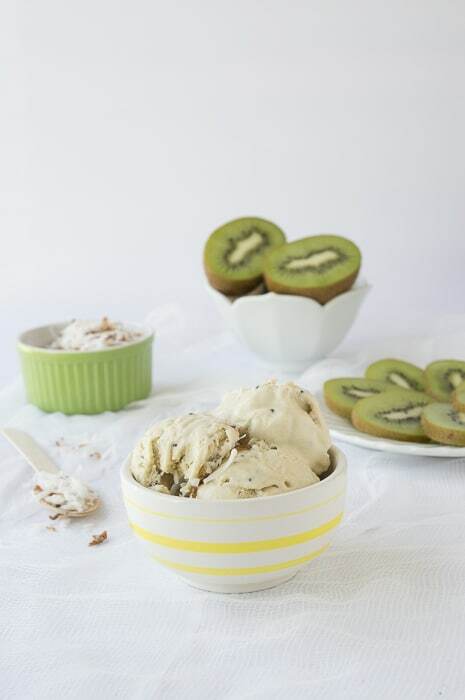 I love that this ice cream includes kiwi. 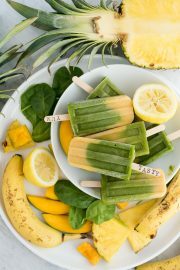 It’s totally something different for summer! Also, I totally feel your pain on the whole no reading for fun time. Blogging is no joke. No kidding Brandy! It’s a 24/7 job! Beth, this ice cream looks AMAZING! I want a triple scoop of it right now, and I don’t even care its not even 8 am in the morning yet! :) YUM! Yeah! Lets have a morning ice cream date!! I promised my daughter we would make ice cream this summer. She is a huge kiwi fan so I just showed her this one. No surprise, this is the ice cream she wants to make. That worked out perfectly!! Enjoy! 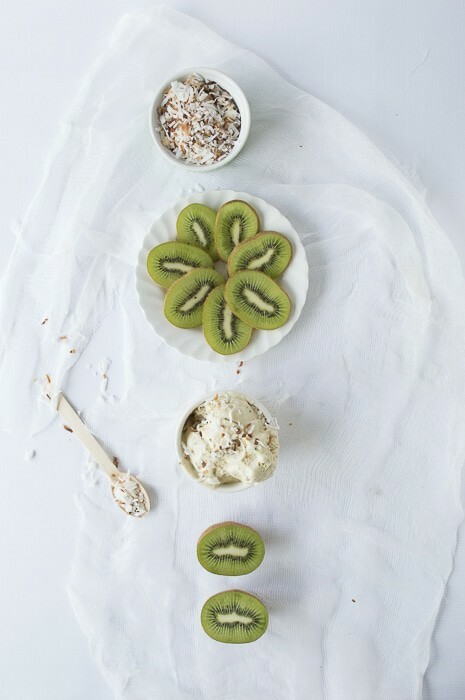 I absolutely love kiwi but have to admit never mixed with my ice cream. Life just got better. Life did just get a lot better! Haha! I like getting magazines because I feel in the loop.. so I might feel left out once my subscriptions stop! I’m pretty sure I have to try this like, right now. Also, I have the same problem with magazines – I end up feeling like a hoarder because I just have a big stack of them everywhere that I feel like I can’t get rid of until I read them all. At least you got some inspiration out of one of them! Exactly! I can’t get rid of them until I read them! 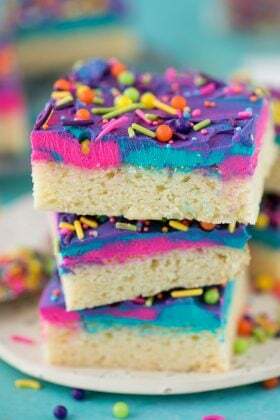 This looks amazing Beth! 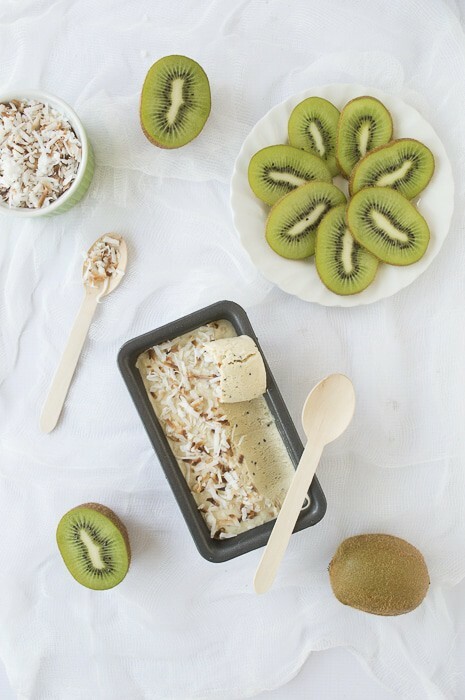 Ice cream anything gets me excited but the kiwi and toasted coconut sound perfect! <3 this! Haha, me too! If someone says ice cream, my ears perk up! Love, Love kiwi! Can’t wait to try it in ice cream. Thanks for the recipe! Pinned. So glad to find another kiwi lover! Thanks for coming by Mallory! What a great flavor combo for ice cream! 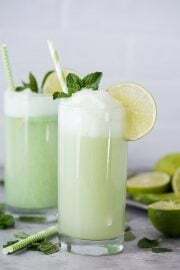 I’ve never had kiwi ice before and this looks great! It’s definitely something fun to try! My family would go crazy for this ice cream! Thanks for linking up with What’s Cookin’ Wednesday! Maybe you can still find time to try it this summer Karly!